I CAN'T EVEN WITH THIS PIE. IT IS LIT. IT IS ON FLEEK. IT IS FIRE. IT IS COOL BEANS AND GROOVY AND FAR OUT, DUDE! All the things kids have said in recent and not so recent times to describe something that is just next level fantastic. Ok, now that I've fully expressed the extent of my excitement, let me just give you a little info about crack pies. 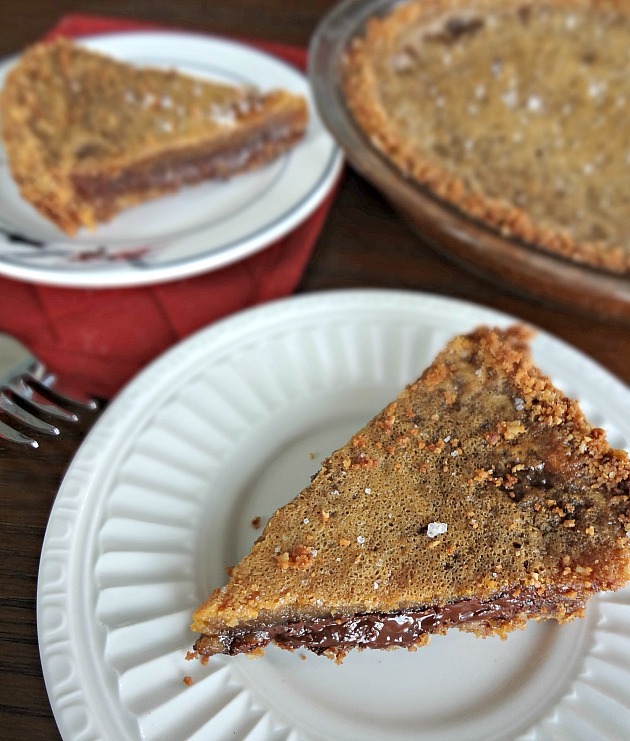 Crack Pie is a dessert that originated at Momofuku Milk Bar and it's essentially a gooey sugar custard filling in an oatmeal cookie crust. And it's addicting sooo I'm guessing that's where the name came from. And it's tasty, forreals, no doubt about it. BUT...well...it pales in comparison to this version. 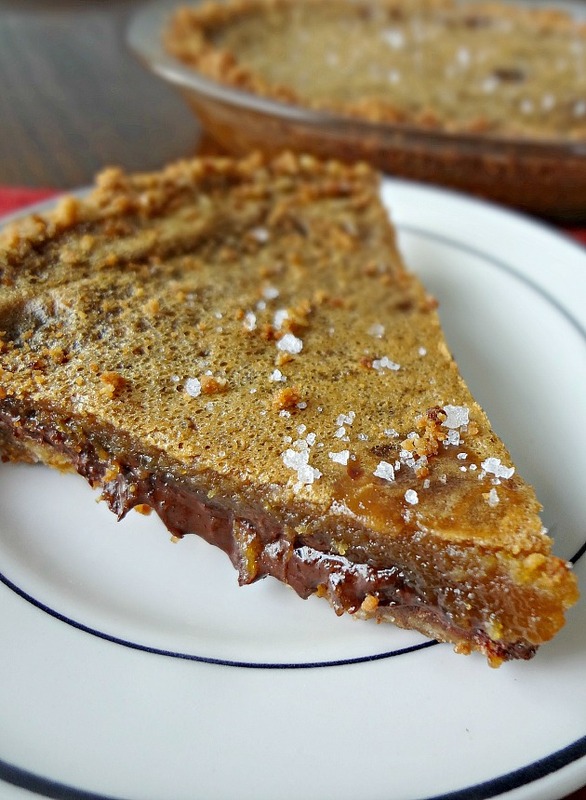 I'm so happy that I decided a salted caramel crack pie should exist. And that it would probably be too sweet and one note so I should add some dark chocolate to balance it, and add whole new levels of decadence. Sometimes...sometimes I have pretty good ideas. Gotta say. 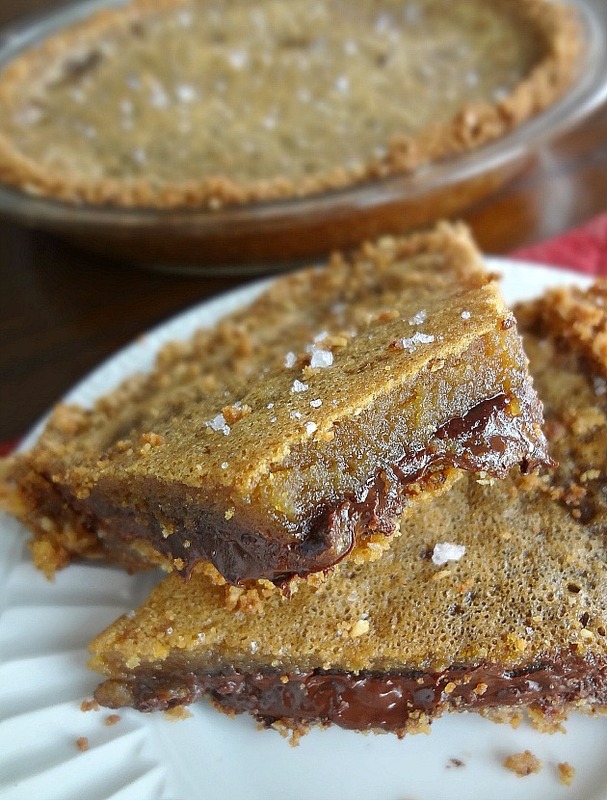 So there's a crunchy ridiculously amazing brown sugar oatmeal cookie crust (which I baked with a little caramel sauce on it because why not), and then a layer of dark chocolate, and then gooey salted caramel crack pie filling. And salt on top. It's rich and sweet and salty and I love it so much and am so stoked that there's a whole other pie of this sitting in the freezer, waiting to be adored. And look....I'm not saying you have to make it for Thanksgiving. But...I'm not not saying it, either. Preheat oven to 375F degrees and line a baking sheet with parchment paper. Cream together the butter and sugars until fluffy, using an electric mixer. Beat in the egg. Stir in flour, baking powder and soda, and salt until just combined. Mix in oats. Spread dough evenly in a very thin layer on the parchment paper and drizzle with salted caramel sauce. Bake for 18-20 minutes, until golden brown. Let cool completely, then finely crumble. Grease two 9 inch pie pans. Divide the crust mixture evenly between the pie pans. Press down into the base and sides, forming an even layer of cookie crust. Set aside while you prepare the filling. 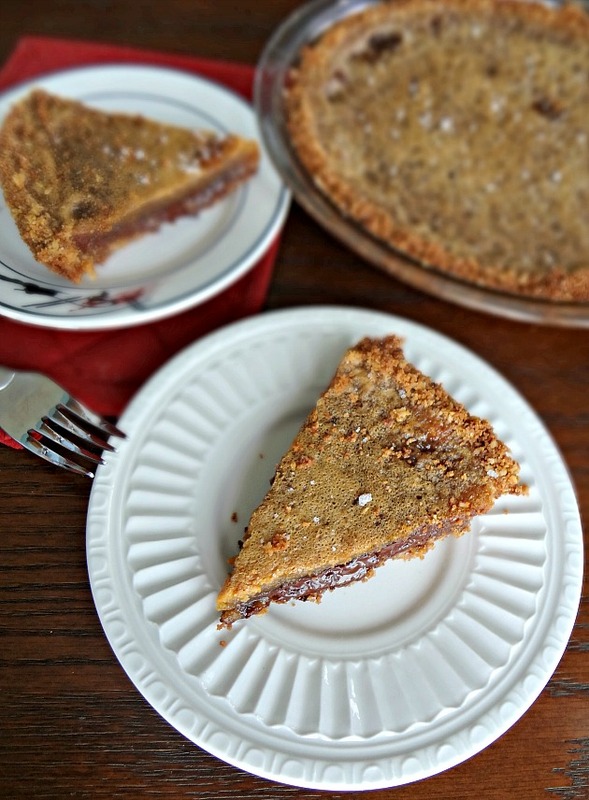 Pour an even amount of the melted chocolate into each of the pie crusts, spreading to evenly coat the bottom of each crust. Combine the sugars with the salt. Whisk salted caramel, heavy cream, and vanilla into sugar and salt mixture. Then, gently whisk in the egg yolks. Divide the filling between the pie crusts. Bake the pies for 15 minutes, then reduce heat to 325 degrees and bake for another 15-25 minutes, until golden brown and the filling is only slightly wobbly. 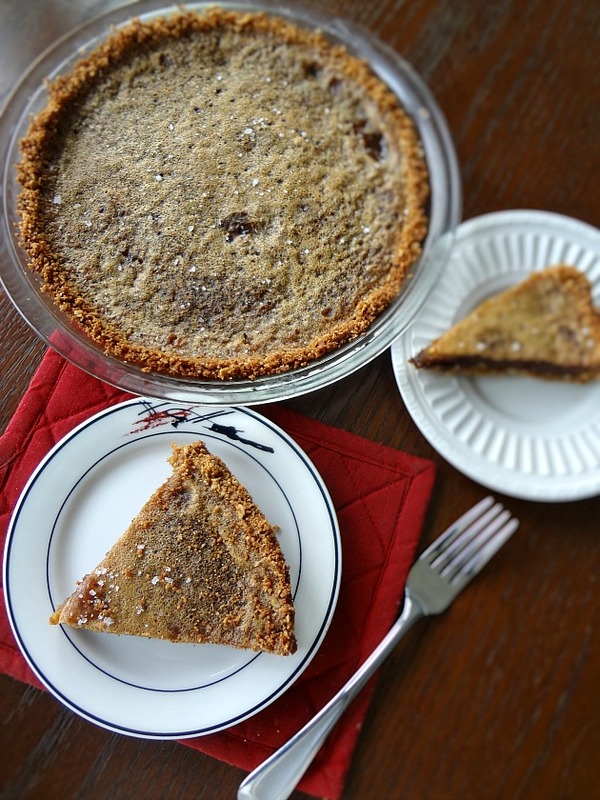 Sprinkle the tops of the pies with sea salt. Let cool completely, then cut. Store at room temperature for up to 5 days or in the refrigerator for up to 2 weeks. Alternately, after cooling completely, you can wrap pie in multiple layers of plastic wrap and store in the freezer for up to 3 months (I like to do this with the 2nd pie). DO YOU SEE THIS. DO YOU SEE THE LEVELS OF GOOEY INSANITY WE'RE DEALING WITH??? ?